Bernhard Langer is a German professional golfer. 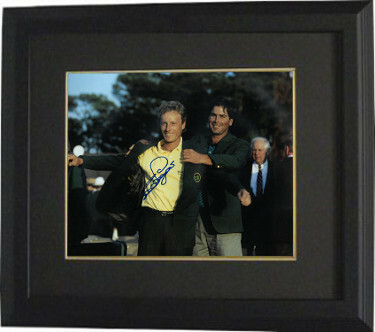 He is a two-time Masters champion and was one of the world's leading golfers throughout the 1980s and 1990s. In 1986, he became the sport's first official number one ranked player. After turning 50, he established himself as one of the most successful players on PGA Tour Champions and has won ten senior major championships. Bernhard Langer has hand autographed this 11x14 Photo. Certificate of Authenticity from Athlon Sports Collectibles. Custom Black Mat and Premium Black Frame as shown.